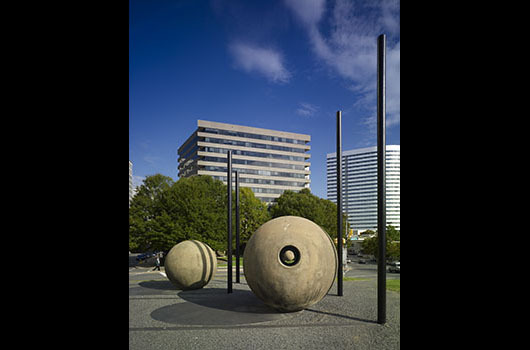 Encompassing landscape architecture, sculpture, and astronomy, Dark Star Park by Nancy Holt is among the first major examples of “integrated public art” that is inseparable from its setting and creates a total environment to be experienced. The work also refers to the area’s history. 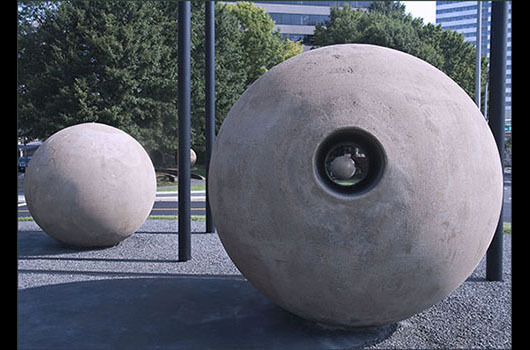 Each year, on August 1st, at 9:32a.m., actual shadows cast by the poles and spheres align with permanent forms in the shape of the shadows on the ground beneath them. The date marks the day that William Henry Ross purchased the land that later became Rosslyn. 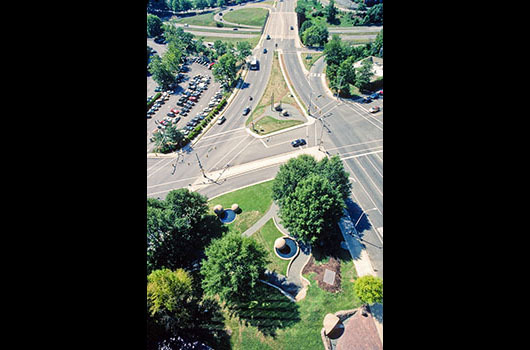 Dark Star Park is located between Fort Myer Dr. and N. Lynn Street, on both sides of N. Fairfax Drive. Funded and developed with support from National Endowment for the Arts, J.W. Kaempfer Company, Arlington County, Theodore Gould, Morris and Gwendolyn Cafritz Foundation, Marriott Corporation, Westfield Realty, Charles E. Smith Building Corporation, McDonald’s Corporation, Weissberg Development, Preston Construction Corporation, Charles and Smith Management, Geneva Associates. Nancy Holt passed away in February 2014. On Tuesday, October 14, 2014, Arlington Public Art Administrator Angela Anderson Adams was invited to participate at a memorial for artist Nancy Holt held at the Whitney Museum of American Art in New York, NY. Other speakers at the event included: Adam Weinberg, Alice Pratt Brown director, Whitney Museum of American Art; Alena J. Williams, assistant professor, University of California, San Diego; Matthew Coolidge, director, Center for Land Use Interpretation, Los Angeles; Jack Flam, president, The Daedalus Foundation, New York; DeeDee Halleck, filmmaker, New York; Tom Martinelli, artist, Santa Fe, NM; Lucy R. Lippard, writer and activist, Galisteo, NM; Virginia Dwan, art supporter, formerly of Dwan Gallery, New York; Serge Paul, art historian, Avignon, France; Chrissie Iles, Anne and Joel Ehrenkranz curator, Whitney Museum of American Art; Joan Jonas, artist, New York; and, Ben Tufnell, director, Parafin, London. Here is a transcript of Adams’ speech.